The SuperDraft is one of MLS's most established events. Since 2003, it has been held in conjunction with the United Soccer Coaches Convention and draws packed audiences of fans, coaches and others working in the game in convention ballrooms around the country to witness this rite of passage in American sports. The game's top young players move from college to the pros and get a chance to thank those who helped them along the way. Their stories are inspiring -- from Siad Haji, the son of Somali refugees who settled in New Hampshire and was taken with the No. 2 pick by San Jose out of VCU in Friday's draft in Chicago, to Tucker Bone, who stood dressed in full dress uniform and thanked the Seattle Sounders for drafting him in the first round when there is no certainty about when he will be available beyond 60 days of leave Air Force Academy graduates are given. And their stories aren't generally known. 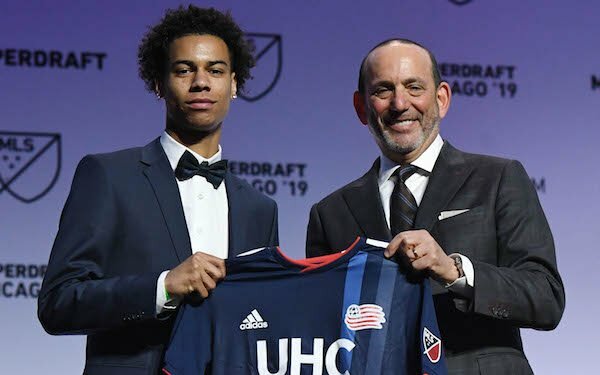 College soccer players generate a tiny fraction of the coverage of the top players in college football and college basketball, who enter the pros as household names, so the spotlight the SuperDraft puts on MLS's newest signings is not insignificant. “Our league needs special moments and our sport needs special moments,” MLS commissioner Don Garber said after the first round of the 2019 SuperDraft in Chicago. “This is a moment to provide a young person an opportunity to stand up there, thank his family, thank his coaches, support the youth system where they came out of, not just the colleges. As a marketing guy at heart, I think these special moments are good for our sport." The problem is that the SuperDraft's relevance has declined. The influx of Targeted Allocation Money has resulted in fewer young Americans getting significant playing time. And in turn those Americans signing as Homegrown players are squeezing out those who have been drafted. Just six Americans eligible for the 2020 Olympics as U-23 players played at least half the time during the 2018 MLS season. None of them went through the SuperDraft. Five were academy players who turned pro via the Homegrown Player mechanism; the sixth, Brooks Lennon, went from the Real Salt Lake academy to its first team via Liverpool's youth system. Four played no college ball -- Auston Trusty, Justen Glad, Tyler Adams and Lennon -- and two played one season apiece -- Reggie Cannon at UCLA and Mark McKenzie at Wake Forest. MLS needs an event for these Homegrown Player signings to get at least equal billing with college draftees -- an event in conjunction with the draft or something along the lines of the NCAA's national signing days with coordinated events to maximize media exposure. The other factor impacting the SuperDraft was raised when the Philadelphia Union's new sporting director, Ernst Tanner, traded all five picks the Union had for allocation money. He felt none of the players available with the draft slots it had would have been better than what the Union has on its USL second team, Bethlehem Steel. “I was very intrigued by it," Garber said of the move, without passing judgement on its wisdom, "and I actually thought the buzz around it was great." Garber is right when he says that there will always be a place in MLS for players raised outside the MLS academy system -- players like Haji, who grew up in Manchester, New Hampshire and whose parents couldn't drive him to New England Revolution practices -- but those numbers are shrinking. Fewer and fewer players will be available who have not already been tagged with Homegrown labels because MLS teams are aggressively recruiting out-of-area players and setting them up in residency programs. Clubs that have USL teams are encouraging players to avoid college soccer altogether and parking them on their second teams. The Seattle Sounders, whose U-16/17s won the 2018 Development Academy championship, have recruited players from Latino communities all across the state of Washington, California's Central Valley and Las Vegas and started signing the best players to USL pro contracts. FC Dallas signings in the last year included players it recruited from Alabama, Arkansas and as far away in Texas as El Paso. The SuperDraft isn't going anywhere -- Garber says there is no guarantee, though, that it remains connected to the coaches convention -- but only time will tell what is its place in American soccer's rapidly changing landscape. Garber said no decision has been made whether MLS will pull its academy teams out of U.S. Soccer's Development Academy but he said he isn't sure if the league will always be as closely aligned with the federation as it has been up until now on player development. Driving MLS's changing positions on player development -- including Training Compensation and Player Development -- is the massive investment being made by MLS owners and the increasing pressure to see a return on their investment. That could be academy players breaking into the first team and saving the costs of transfer fees to otherwise fill lineup spots or academy players like Alphonso Davies and Tyler Adams being sold for large fees. If you combine what MLS clubs are spending each year on academy and USL programs with the cost of the half dozen new training facilities that will be built, you're easily talking about $500 million or more on player development costs over the next three or four years. That's reaching levels where some owners are starting to wonder whether it would be easier and more efficient to take that money and pour it into increased spending on TAM and more Designated Players, mechanisms generally designed to bring in better foreign talent. "We have to start making a return on that or I can't look an owner in the eye and say this makes sense," Garber said. "This is not a philanthropy. This is about trying to build the right kind of environment to develop players that teams can find effective. If they can take that money and say, 'Give me that money in TAM or a Designated Player so I can satisfy my fans,' then that is something that is counter in the long term to decisions we have to make in youth investment. We do need to see more return." 9 comments about "MLS puts everything on table in addressing American soccer's rapidly changing player development landscape". frank schoon, January 14, 2019 at 9:40 a.m. He learned to play in Kenya. Did not remember too much oter than kicking ball around 3 in the streets, , moved to US at 4, learned to played in parks in the summer and streets of New England, played in the gyms during the long winters. Ended up at VCU where the coach had to teach him what defense was, didn't have clue. Bob Ashpole, January 14, 2019 at 10:19 a.m.
Roster composition is driven by league rules. If the league adjusted its rules, it could generate more roster space for US-eligible players. Other countries mandate minimum minutes for domestic players. There are other ways, however, in MLS which has roster size and salary caps. The Homegrown player rules are an example of rules already in place. The Homegrown player rule is not actually aimed at domestic players, but rather at youth development. A rule favoring domestic players could be as simple as discounting the cost of US-eligible players against salary caps. Or providing additional roster slots exclusively for US elibible players that do not count against salary caps. There are lots of ways to include more domestic players without unbalancing rosters or making selection for every roster spot always a competition between domestic and foreign players. I am not suggesting wholesale changes, just a tweak to see what develops. Frans Vischer, January 14, 2019 at 12:06 p.m.
MLS should follow the Mexican first division's lead, and demand that all clubs play a minimum of 2 U-21 players every minute of every game. The results in Mexico's national team have been terrific. If MLS did this, clubs would see the value of their development efforts. R2 Dad replied, January 14, 2019 at 1:54 p.m. Yes, but that would require Cordiero to grow a spine. And since he's Garber's lap dog, that is highly unlikely. Wallace Wade, January 14, 2019 at 12:53 p.m.
Don Garber wants to “support the Youth system” that developed these players? That’s hilarious!! Deeds not words Don. R2 Dad, January 14, 2019 at 2:26 p.m.
"We do need to see more return." Do we? I'd like Don to propose that for every MLS club that wants to move in the future, a 50+1 entity would be organized by the league to buy the club so it can stay. That club would then be owned by those fans. That way, MLS doesn't need to see more return because it's a community decision, not soley a business decision. This concept works in Germany, and would prevent another Columbus Crew situation in the future. This concept of ROI for the owner's investment should be supplemented by the ROI that fans invest into their club in the form of tickets, concessions, TV eyeballs et al. But that might require a transition from passive consumers to active supporters--a good thing. Jon Rakestraw, January 14, 2019 at 5:52 p.m.
Great article Paul. Yep, from my experience as an agent, you are spot on. The college game is declining in relevance. This is partly due to the fact of the college format: short season plus players are also focused on academics. Also it does not help that an agent cannot talk to a NCAA eligible player. However, as Double Pass will attest, the academy system in Europe has a very low success rate in developing pros. Many graduates washout and have little to fall back on. The college game game is a super place to develop for late bloomers and gives you a degree to fall back on. Therefore it will have its place for years to come. At at some point MLS will have an “MLS 2” which will foster more opportunities for development. Checkout my Rabonaboyz blog for more info on this and development in general. Last point, Ajax encourages street soccer up until 16 at which point the kids are FT. We would do well to support this grassroots street soccer approach at Travel and academy clubs. frank schoon replied, January 15, 2019 at 8:41 a.m.
beautiful game, January 14, 2019 at 6:47 p.m.
"If you combine what MLS clubs are spending each year on academy and USL programs with the cost of the half dozen new training facilities that will be built, you're easily talking about $500 million or more on player development costs over the next three or four years." Player Development...only if there is a process and people in place to execute the plan.